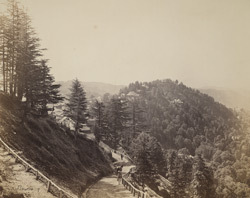 Photograph of a view of Simla from the 'Strachey Collection of Indian Views', taken by Samuel Bourne in 1863. Simla was the former summer capital of the British in India, established during the Nepal War of 1815 and enlarged in 1822 when Captain Charles Kennedy was appointed Superintendent of the Hill States. It was favoured owing to its pleasant climate and the station rapidly acquired a reputation as a sanatorium. Simla is built across a range of hills and connecting ridges, spectacular views can be seen in this area with rows of snow capped peaks disappearing in the distance.